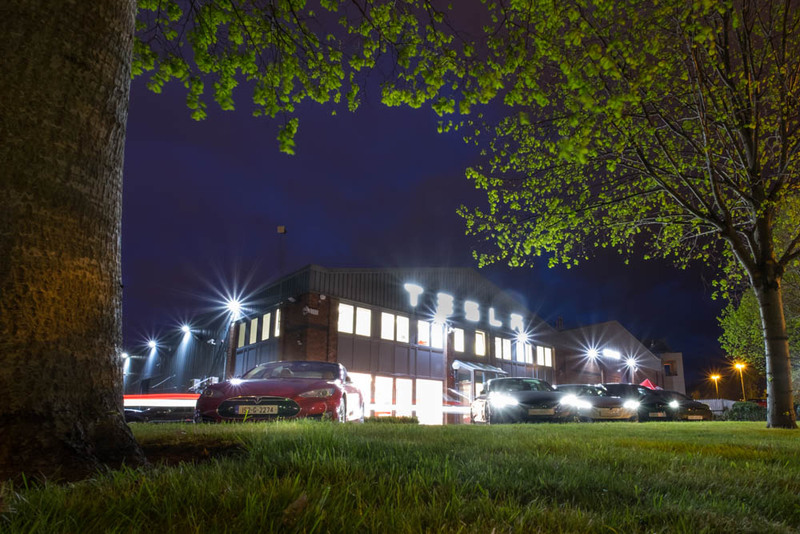 The 26th of April saw Tesla’s official arrival in Ireland with the launch of their Dublin Showroom and Service Centre in Sandyford. 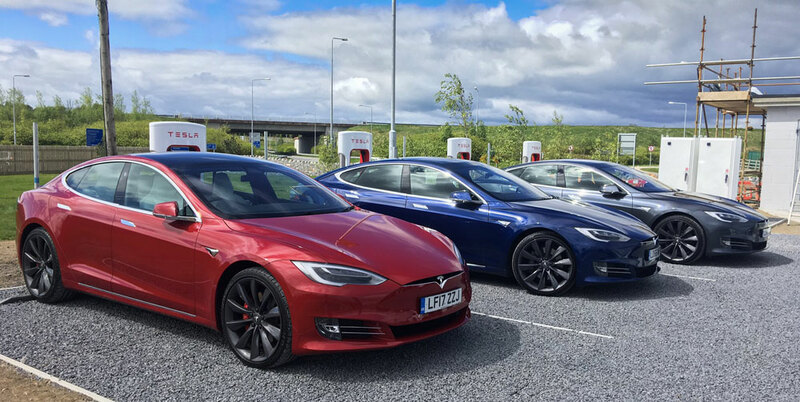 We joined Tesla the next morning to spend the day driving the Model S and Model X as well as visiting the first Supercharger in Ireland. Read on for all the details and check out the video of our thoughts on the day at the end. The new Dublin store at 92 Bracken Road on the Sandyford Industrial estate is a repurposed pharmaceutical warehouse. The unit has been face lifted to perform the dual roles of showroom and service centre. 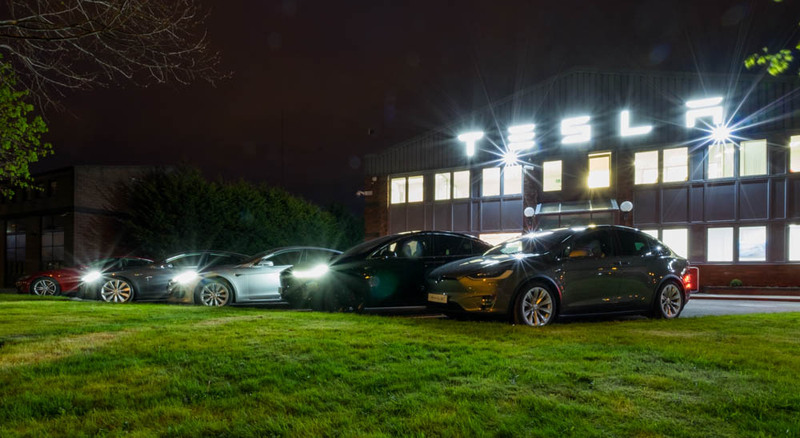 We eagerly arrived just before 10am and were led to the Customer Lounge just off the showroom, Laura, the Communications manager for Tesla UK met us and after signing the insurance waiver and a short introduction to the cars from Laura and Emma it was time to get underway. 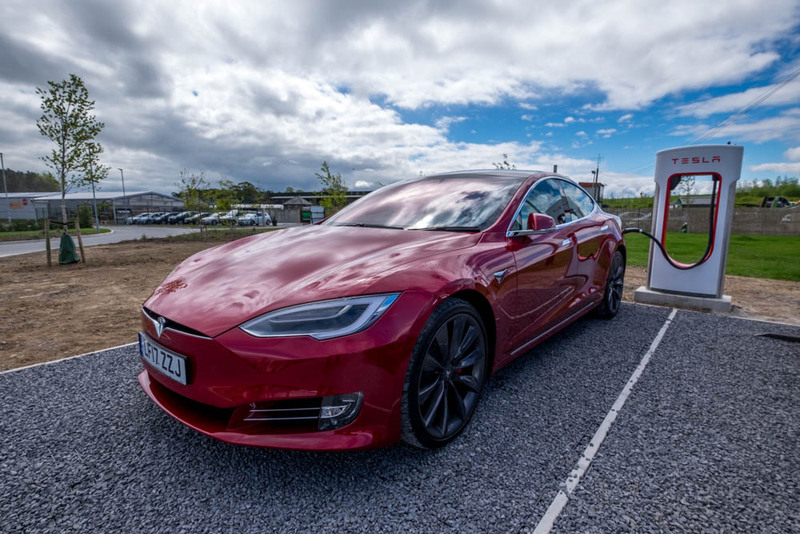 The event was split into 3 stages..
Dublin showroom to Ballacolla Topaz service station, the first Supercharger site in Ireland (116km/72mi). 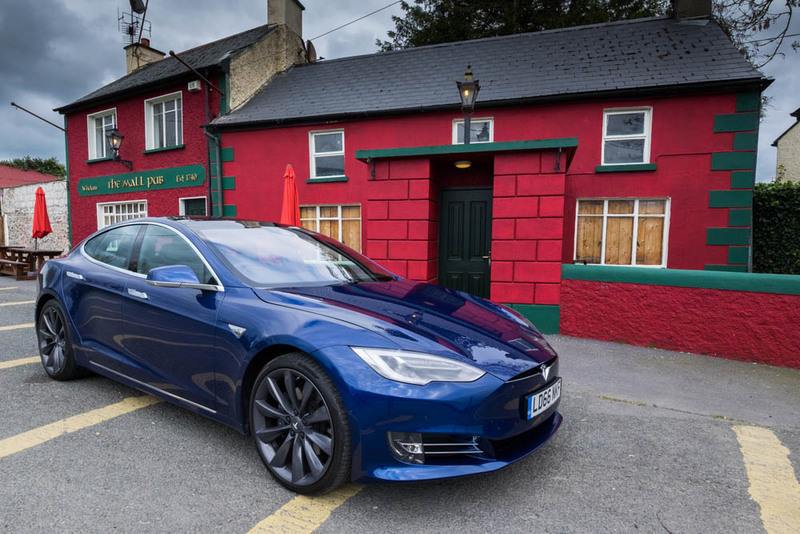 Ballacolla to Brooklodge Hotel, Macreddin Village, this hotel has multiple Tesla destination chargers installed. (90km/56mi). 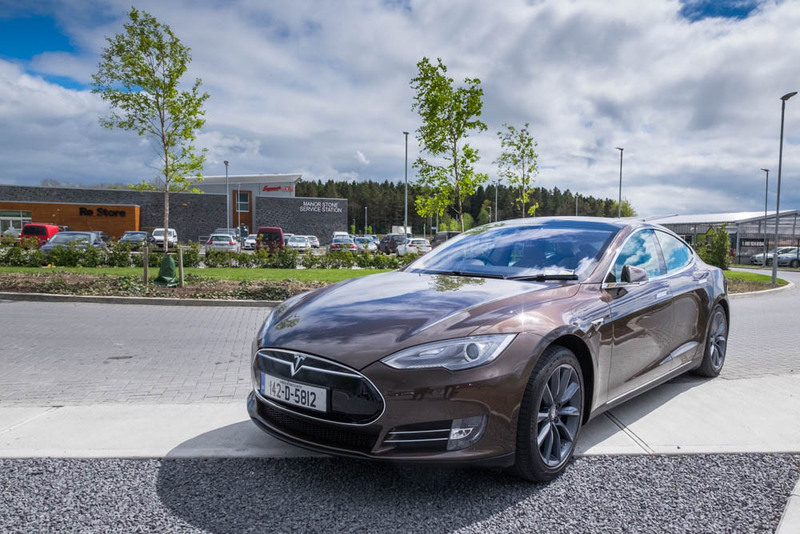 Brooklodge hotel to Tesla showroom Dublin (66km/41mi). 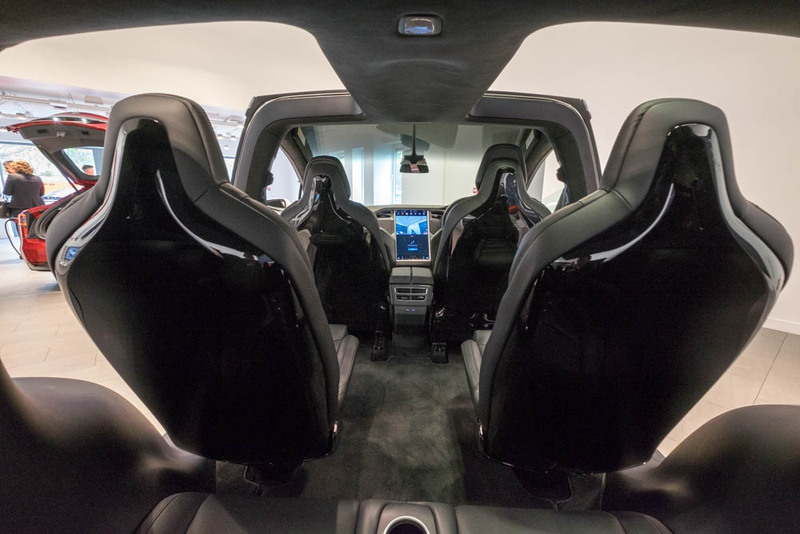 At the start of each stage we would switch to a different model and specification, the event was designed to give a broad feel of the cars across all driving scenarios, from motorway to A and B roads. It should be noted the use of the chargers at each stage was not required, this was just a demonstration of the technology for the event. The distance involved (272km/169mi) was well within the capabilities of all the cars without charging. So we were handed the keys of our first ride, a grey Model X P100D, to head out to the Superchargers for the first leg of our journey. If there is a P – This means the Performance model, higher spec, performance optimised for speed. 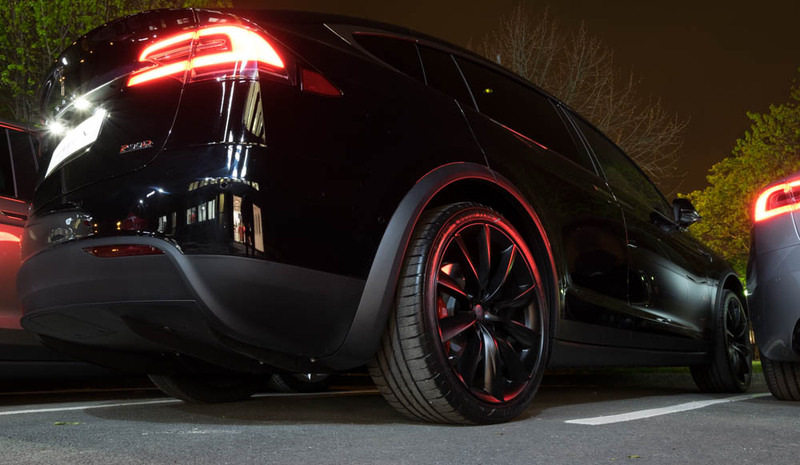 If there is a D – This means Dual drive, or All Wheel Drive as there are 2 electric motors, 1 for each axle, this not only increases grip, it also increases efficiency meaning AWD Tesla are more economical. 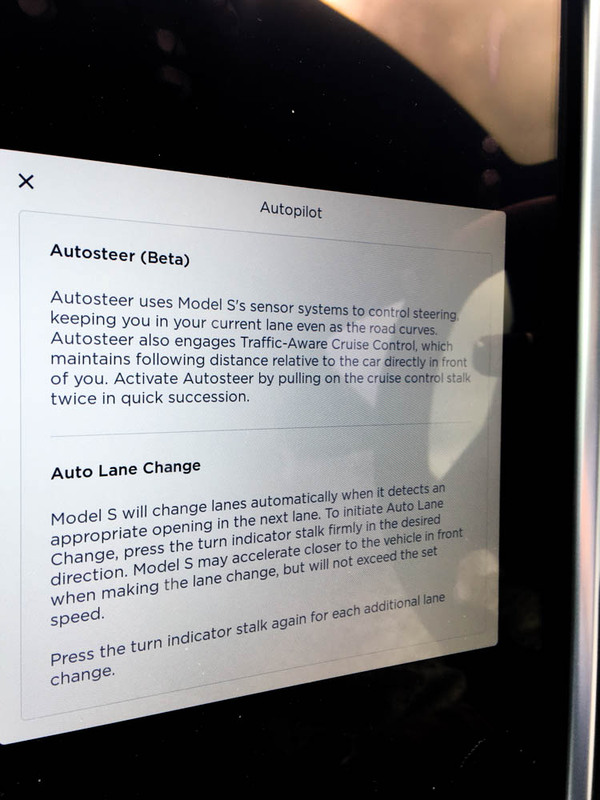 Subtly if the model name has an underline, then the car has ‘Ludicrous’ mode which is an admittedly expensive option that with some hardware and software tweaks, provides even more stomach churning acceleration. 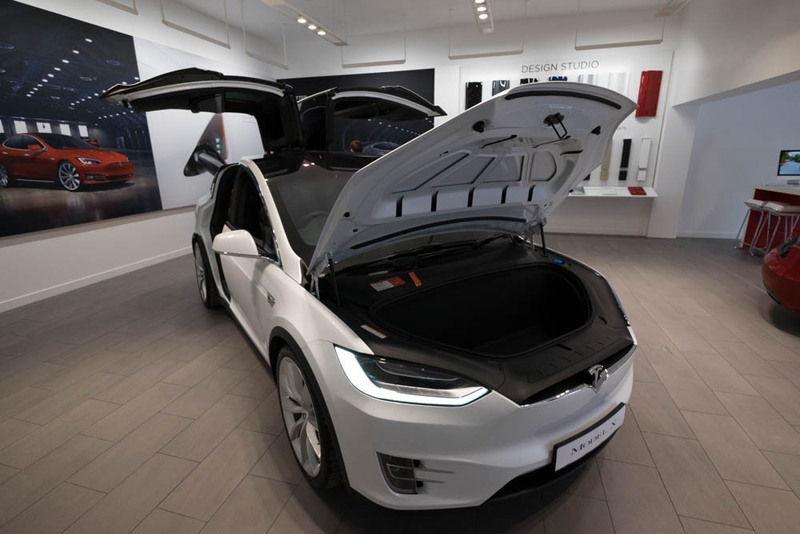 The Model X is available in both 6 seat (2 x 2 x 2) and this 7 seat (2 x 3 x 2) option. 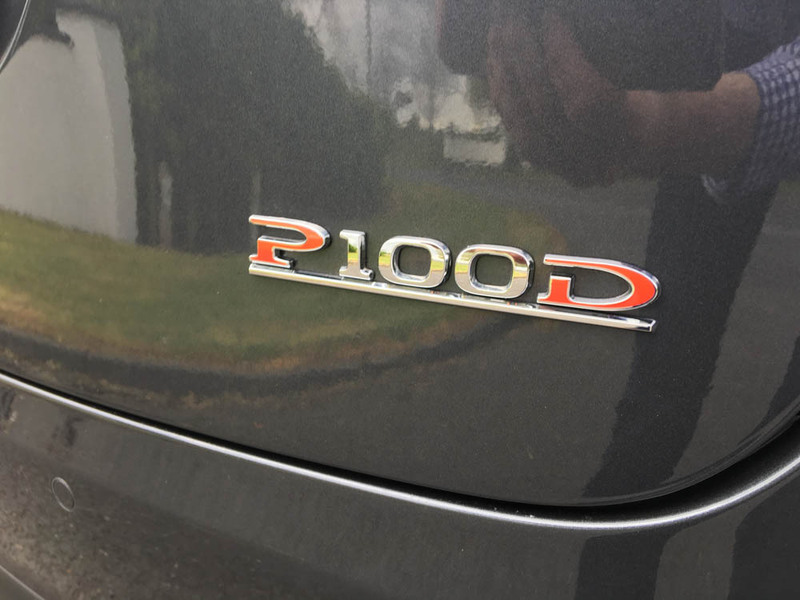 It’s the range topping P100D Ludicrous and its is a big SUV, much larger in the flesh than appears in photos. But with that amazing electric torque on tap you rarely feel its weight or size. This first leg was mostly motorway, so we didn’t get to find out how the handling was on our Irish roads, but the performance is incredible. Our 70 mile drive to the superchargers [Video] was all motorway and a little dull as a result, well as dull as life can be in a 605BHP (779BHP at the motor) tech-filled monster. 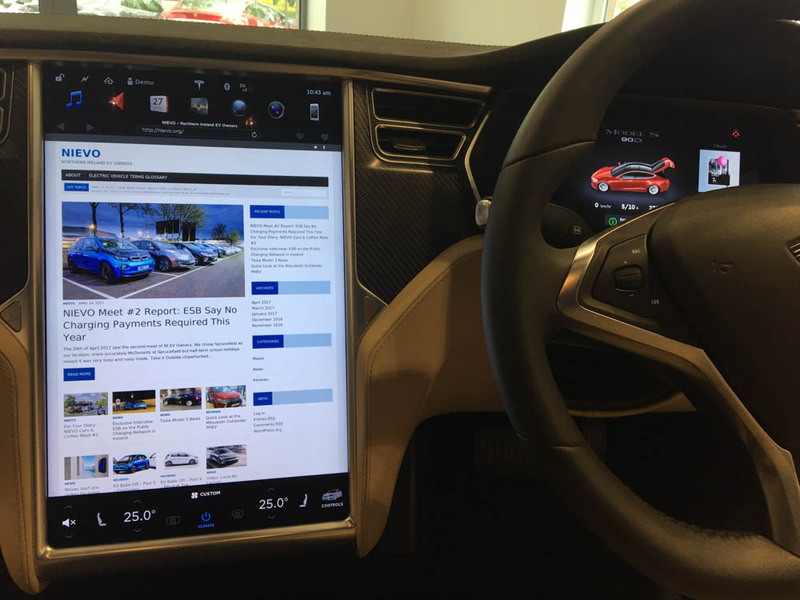 Tesla’s 17″ display dominates the interior of the car, with only 2 physical buttons, one for hazards and one for the glove box. The control screen has been discussed many times, some hate it some love it, we are probably in the middle ground here. 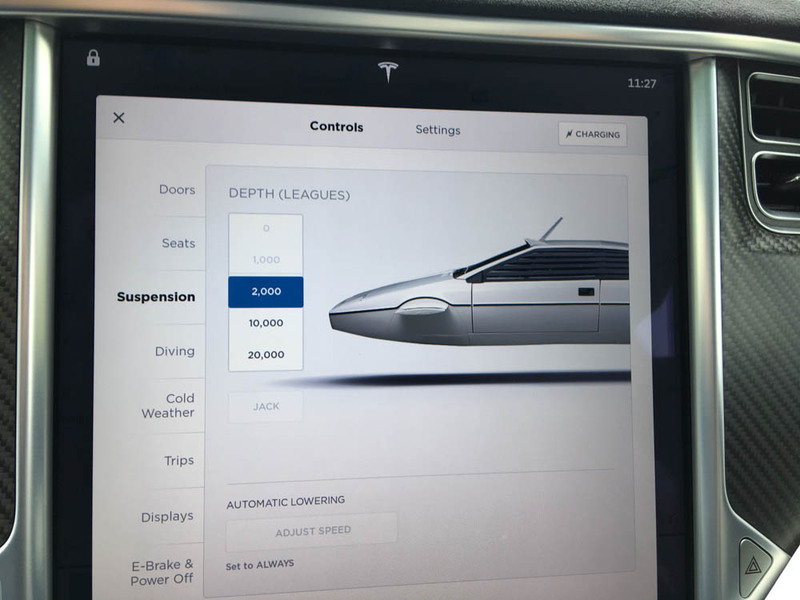 The display is nice and provides great space for all the features, however the controls are not particularly intuitive with so many screens full of options. No doubt you’d get used to it, but it’s not a jump in and instantly know where everything is type of UI. With industry leading battery capacity comes the need for industry leading chargers to keep them topped up. 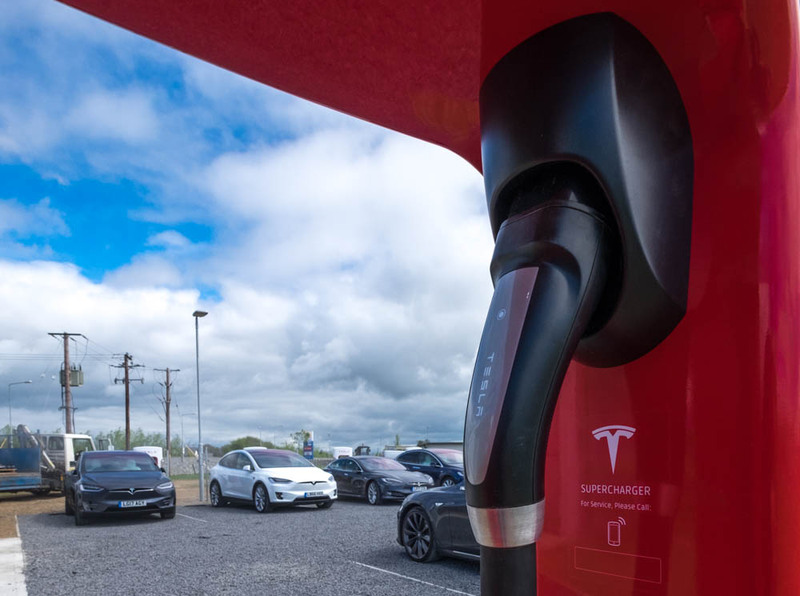 The Ballacolla Supercharger is Tesla’s first in Ireland and it’s located at the Topaz service station off Junction 3 of the M8. It has been sited to serve the busy route between Dublin and Cork and it looks like it’s the first of a roll out of around 4 nationwide. 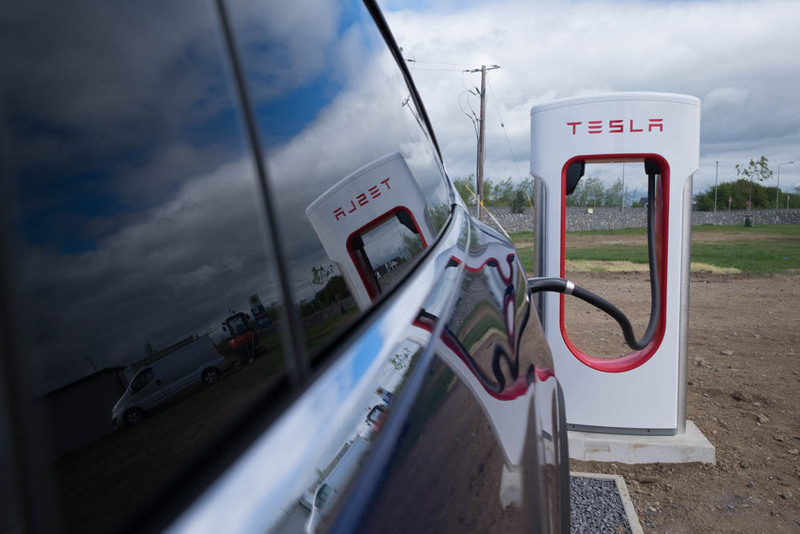 The site consists of 8 Superchargers each capable of providing power up to 120kW into the Tesla cars battery, this could equate to up to 170miles in 30 minutes. They were still adding the finishing touches to the site that had just opened the previous day. 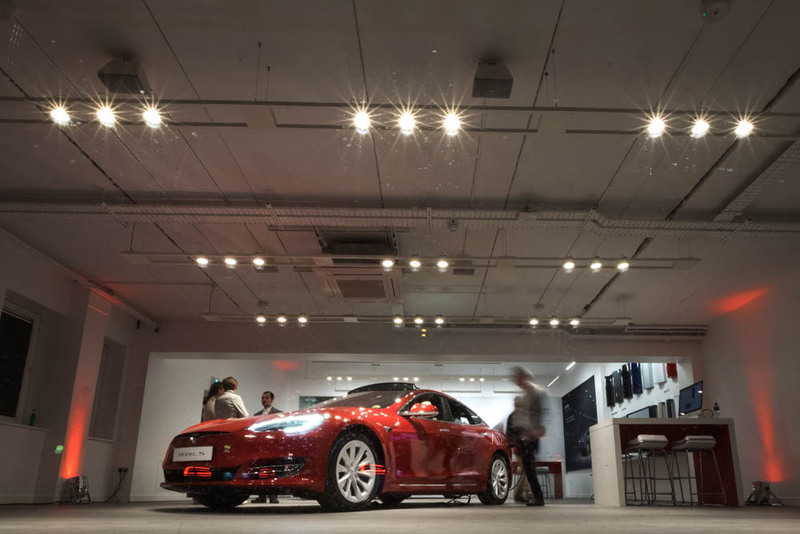 Tesla owners get 400 kWh free each year. After that the cost is 20c / kWh – lets hope ESB takes note as that seems appealing to our ears. By a happy coincidence we met Ireland’s first ever Tesla owner, Nigel who turned up in his 3 year old Model S 85. Nigel was very enthusiastic about the car and told us he was considering upgrading to a new model to take advantage of the new Autopilot. We had a sandwich and chatted for about an hour then swapped over to a Model S for the next part of the journey. This 56 miles drive was much more rewarding, the combination of the lower car and the smooth B roads winding up to the BrookLodge Hotel made it our favourite part of the day. At one point there was a real feeling of euphoria created by the heady mix of a great driving road, incredibly surefooted AWD torque delivery and some analogue synths from Heaven 17 blasting on our in-car Spotify 80’s playlist, fantastic! For the big wheels all these vehicles are running they all ride extremely well. They were also all fitted with the optional air suspension which improved the comfort and meant raising and lowering the body was just a tap of the screen away. The system will memorise the GPS location you regularly raise the car – to go over a ramp for example – and do it automatically. 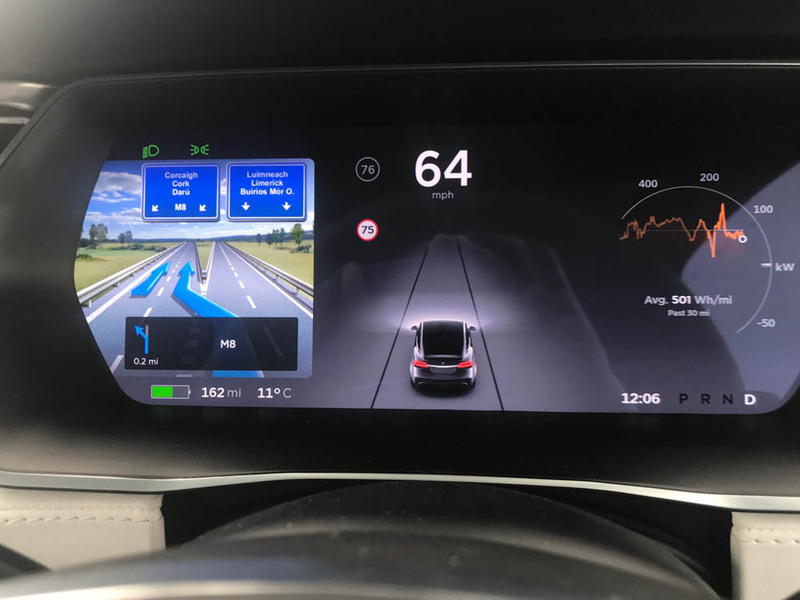 This was the only car of the 3 we drove that had Autopilot enabled, Tesla’s semi-autonomous self driving system that can steer automatically as well as accelerate and brake. We tested this system on Major roads and also some B roads and were mightily impressed if not somewhat freaked out at times. 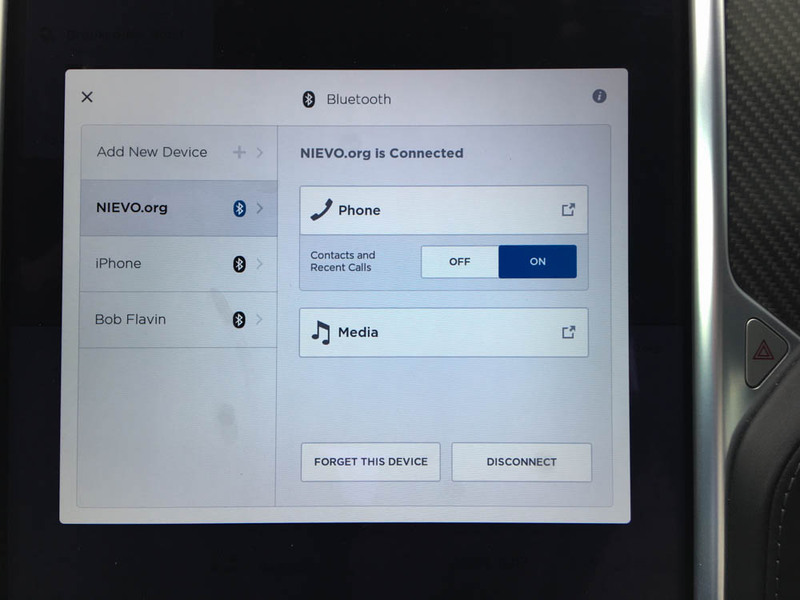 Very impressive technology and a major part of the fully autonomous self driving capabilities Elon has been working towards. 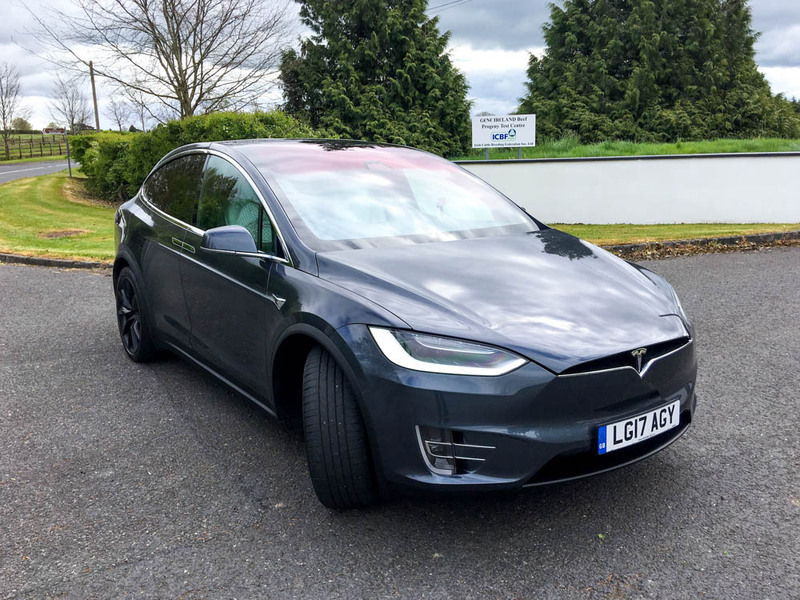 Our last stop was at the Brooklodge hotel for a delightful afternoon tea (it’s hard work this car reviewing lark) and a chance to checkout one of Teslas destination chargers. These are slower chargers which provide up to 60 miles of range per hour, easily giving Model S and Model X a useful charge in a few hours. 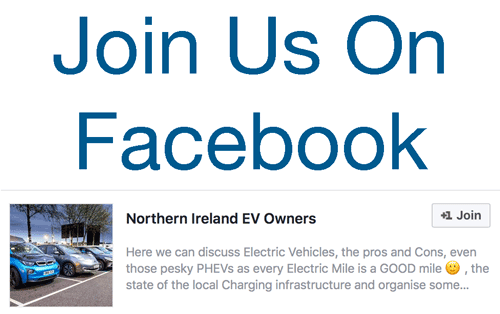 Checkout this map for an up to date list of Superchargers and Destination chargers in Ireland. For the final 41 mile blast back to Dublin we were given the keys to the daddy, the Model S P100D Ludicrous. With its 2.7 second 0-60, this £155,000 monster is an electric vehicle that embarrasses all but the most exotic 7-figure hypercars whilst having seating for 5 adults (and potentially 2 further rear facing child seats in the boot). 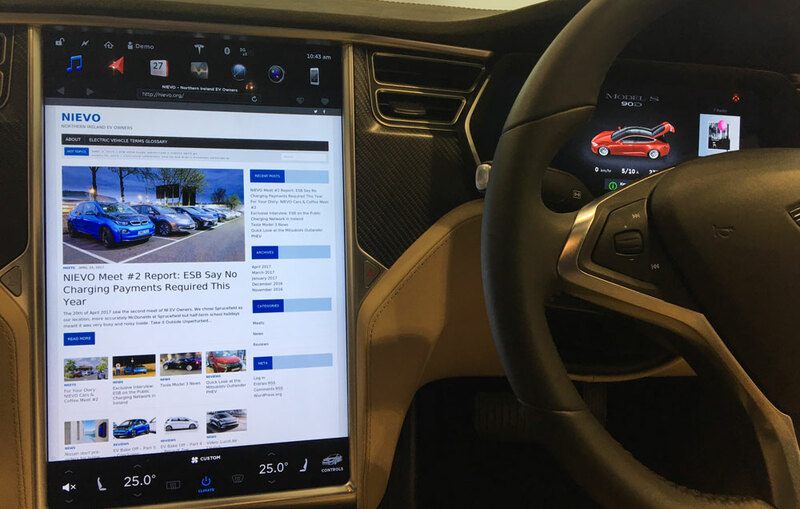 The Model S is a large and heavy sports saloon but its exceptionally low centre of gravity means it still feels great in the corners. 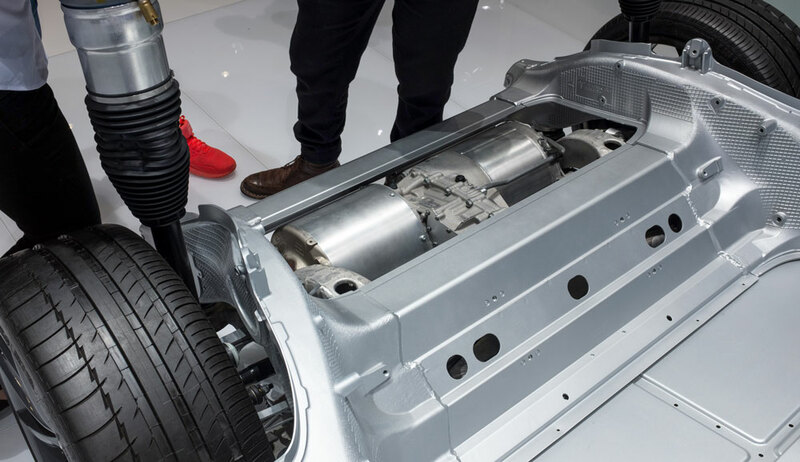 Here’s a photo we took at the Geneva Motorshow showing how low the inverter and rear motor lie in the chassis. The regen as you lift off the accelerator in all of these cars is pronounced, but as EV drivers we’re use to it. The one-pedal driving and lack of a gear box (even an automatic one) makes progress feel effortlessly smooth. This car could cross continents as rapidly and comfortably as the most capable of fossil fueled GT cars. 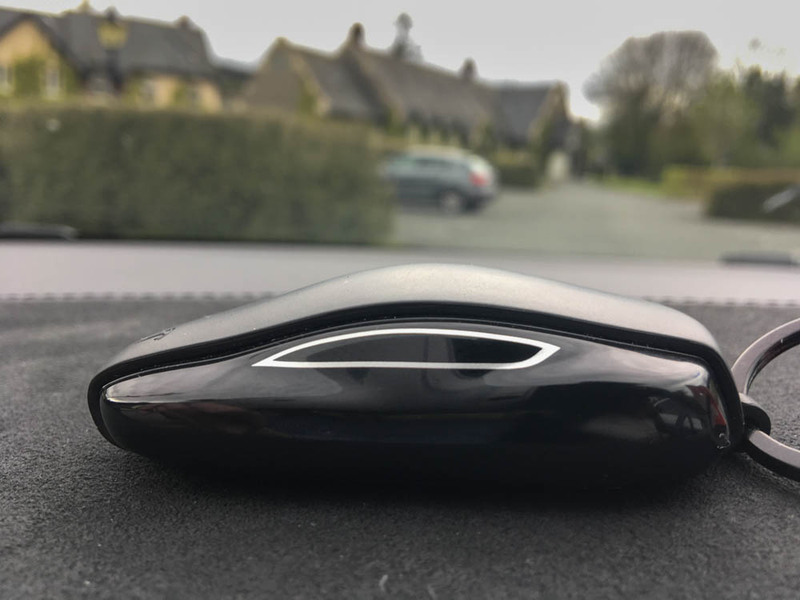 The Tesla marketing team have had a busy week in Dublin. They told us the cars are in more demand than ever as there’s interest from so many different sectors – Automotive, Lifestyle, Tech and Business. We talked about the seemingly strong residuals and they told us that currently there’s not a single Certified Pre Owned car available for under £50,000. 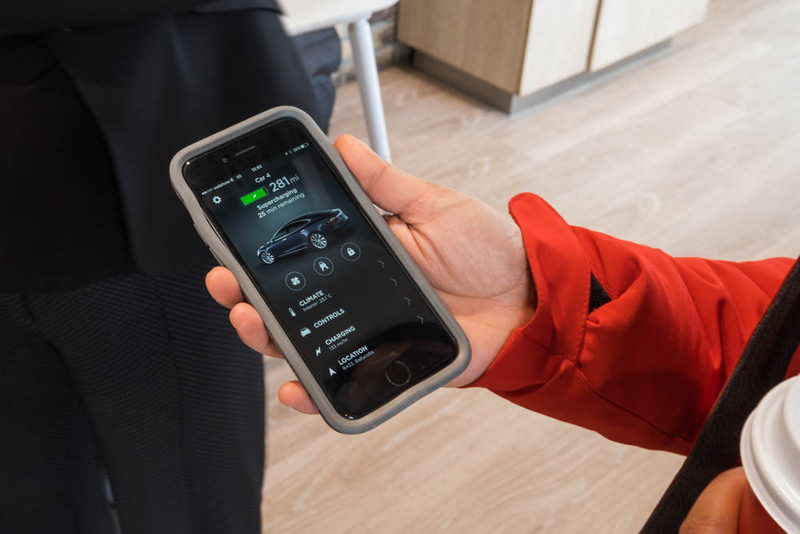 We asked if customers from Northern Ireland could collect their new cars from the Dublin showroom but it looks like they’ll still have to deal through Edinburgh or another GB store, at least for now. You see when you accelerate in an ICE car you drop a gear or two, the engine revs build and the noise rises, the turbos spool up and as you build speed you change gear multiple times to reach v-max. 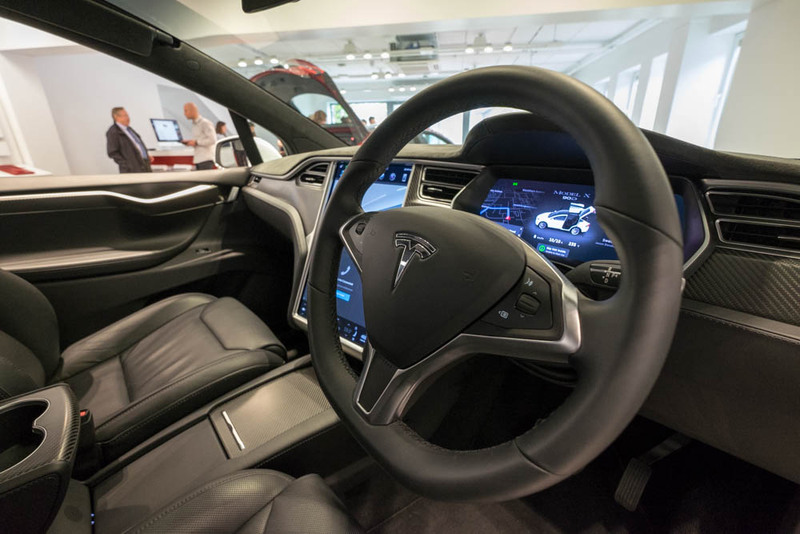 In the Tesla there’s no noise, no fuss, just mind-blowing mountains of tree wrenching torque. I’m not saying the ICE experience isn’t enjoyable, it IS, we are conflicted petrolheads at heart. But with a Tesla it’s a brand new warp drive sensation and a total mind reset. There’s no denying these cars are expensive, very expensive. But while the finish and trim is not on par with the Germans, for us, this negative is far out weighed by the entire driving and ownership experience. The Performance models, while stunning, are unnecessary. We’d choose a Model S 75D or 90D tomorrow. We left the showroom, thanked our hosts and climbed into our car for the journey home. A vehicle that had felt pretty rapid and accomplished just a few hours previously, the Golf GTE PHEV, seemed have got awfully slow and noisy. It’s not every day you get to hoon around in half a million pounds worth of California’s finest automotive creations. While these are exotic beasts aimed at tempting away the Porsche and Maserati set, the Model 3 promises to bring a similar experience at a more affordable price. …and we can’t wait to try one. 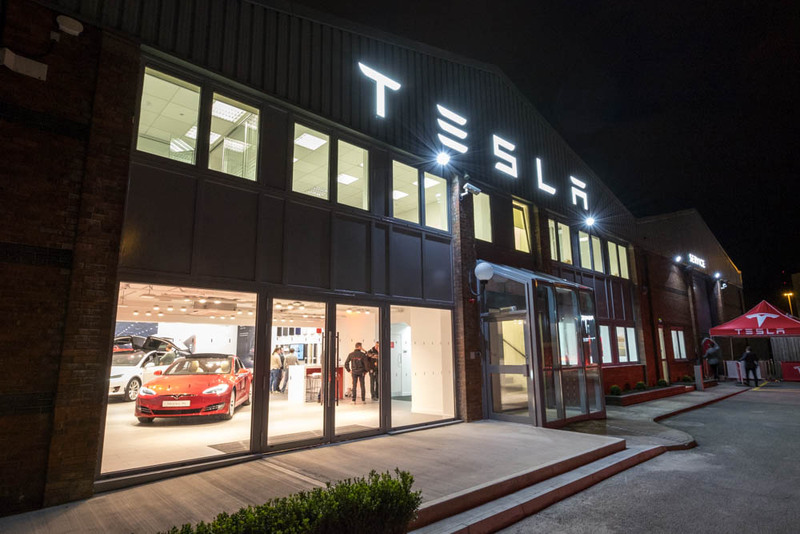 Be the first to comment on "Video: Tesla Opens Dublin Store – Plus Model S and Model X Test Drives"